The Ranunculus root shown here serves to illustrate the relatively simple structure of a young dicotyledonous root. The main reason for the relative simplicity in root anatomy, is the fact that there are no leaves and therefore, no associated leaf traces entering the root vascular system. The primary vascular core (stele) remains relatively undisturbed, and becomes more complex, but then only with the introduction of secondary vascular tissues which are found in roots of dicotyledons and gymnosperms only. The Ranunculus root produces limited secondary vascular tissue. This is initiated between the metaxylem and metaphloem strands. 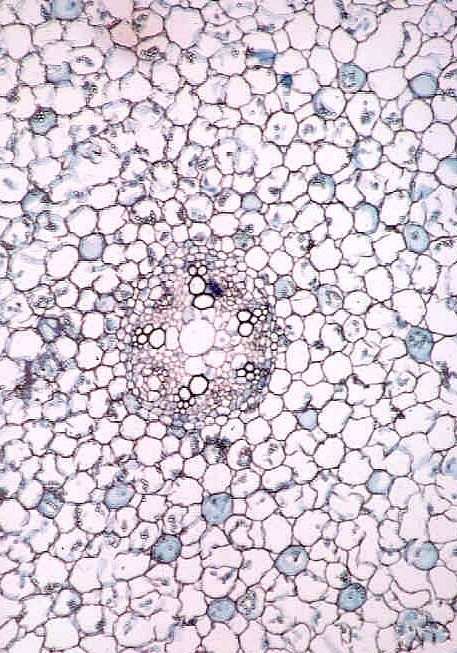 No secondary vascular tissue is visible in this young root however and the vascular tissue is composed of primary xylem (proto and metaxylem elements) and primary phloem (proto and metaphloem elements) only. Note that the cortex lacks secondarily - modified or lignified mechanical support tissue. It appears to be entirely parenchymatous. Why? Obviously, the structure is supported by the soil within which it grows and thus needs limited support. Click here for a more detailed image of the vascular tissues, including cambial initiation this root.